SEO doesn’t have to be difficult. In fact, it’s better if it isn’t. Smart people tend to overcomplicate things. Especially when the rules of the game are opaque. Thankfully, the end game is still the same. The day-to-day tactical stuff might change. But the objectives are still intact. The underlying principles haven’t evolved. So keep it simple. Stop with the pivot tables and algorithm-chasing. Instead, spend more time on what works. There are already SEO wins sitting in plain sight. You just need to know where to look. 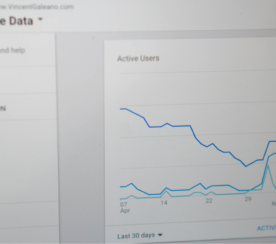 Here are three areas inside Google Analytics to start with. Today’s content continues to get harder and harder to create. Which means it takes longer and longer, too. A single glance at the evolution of Orbit Media’s blogger survey confirms it. This year marks the third time they surveyed thousands of professional content creators. And the number one finding, for the third year in a row, is that bloggers are spending more time on each post than ever before. Unfortunately, most don’t have the time to publish more. 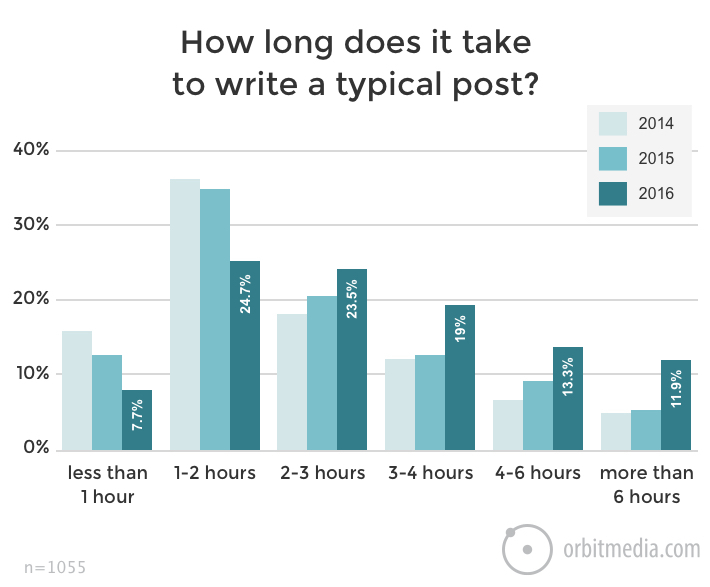 Let alone spend significantly longer on each post. Thankfully, you don’t necessarily have to if you want to see good results, either. Last year, Unbounce decided to stop publishing content for two weeks. They jumped off the content hamster wheel long enough to go back and upgrade their old content. So, yeah. That was worthwhile. Here’s a tip for isolating your old content with the highest potential to help them reach new heights. 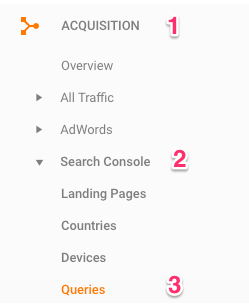 Under Search Console, look for the “Queries” option toward the bottom. Of course, “(not provided)” will consume most of your queries. That’s the world we live in. But just under that, you’ll find which search queries are sending you the most traffic. And then over on the far right, you’ll see where that stuff is ranking (to bring in all that traffic). Google’s job is to deliver the best results to someone’s query. Consumers should expect the stuff in the first few positions to be better, more relevant, or more thorough than the stuff toward the bottom, correct? As a general rule, that’s why the stuff toward the top gets clicked more than the stuff toward the bottom. We can argue about SERP click-through rates. But the point remains: stuff on page one will get clicked more often than the stuff on page two. Generally speaking. Now, smart SEO professionals see the problem. Things aren’t always quite this simple. And the stuff toward the top of page one isn’t always better than the other stuff. 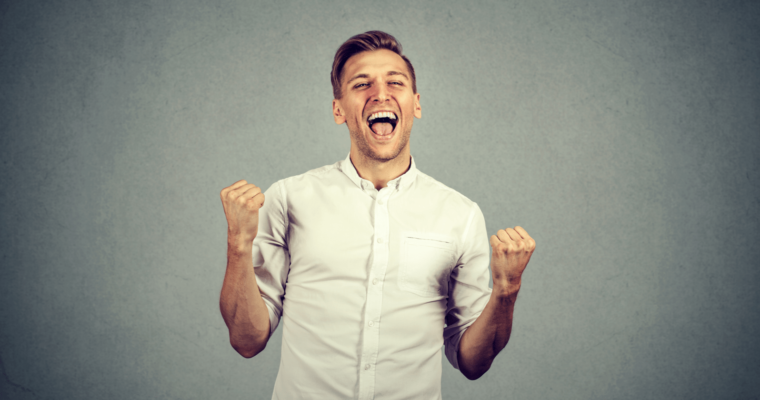 We’re going to find your content ranking toward the top of the second page in Google. You know, where all the dead bodies are buried. Save the results, and you’ll see the proverbial ‘low hanging SEO fruit’ staring you in the face. On the left, clicks are super low. Obviously. Second page of Google. But just to the right, you see the potential: Tons of impressions. That means you could be getting a decent slice of traffic. If you were in a much better position. You know what comes next. Skyscrapers. 301 redirects. All that fun stuff. You already know the tactics. The key is knowing where to look. And then doing something about it. Site-wide bounce rates are useless. They tell you nothing. Site-to-site comparisons are similarly problematic. Bounce rates for blogs will undoubtedly be much higher than commercial sites. Not just because of your own site’s content, but also because of the visitors coming to view it. Marketing’s not always clear-cut. Data lies. All the time. The only way to glean any insight is to go deep and layer in context. Getting a page to rank higher, like in the first step, is awesome. But only if those people are sticking around. Only if they’re subscribing or opting in or inquiring or calling. 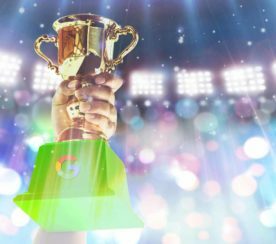 So let’s figure out which high-ranking pages are bringing in tons of search traffic, but failing to turn those visitors into leads or customers. The goal is to look at your top performing pages from Google only. That way, you’re stripping out all the pages and posts that perform well in paid campaigns or get huge spikes from referrals and PR pushes. Blog post search traffic will commonly have high bounce rates. It’s just the nature of the beast. You’re getting ‘cold’ traffic who might be interested in a topic, but not you. 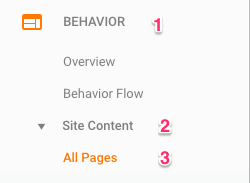 However, pages with both a high Bounce Rate and high % Exit are a problem. Like that second one down in the example above. That means your page is off. The content doesn’t match search intent. It’s outdated and therefore irrelevant. It’s ugly. It’s not mobile-friendly. It’s not long enough. There are tons of possibilities. Your job is to survey, tweak, iterate, and test. Once again, you know where to take it from here. 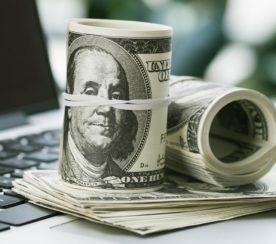 The first tip should get more people to your site. The second tip should get more people to stick around longer. Now, it’s time for the payoff. Let’s get more people to convert. The easiest way? Send people to the pages that are already working. The trick, yet again, is finding that information in the first place. People already flow through your site and convert. You can force them through restricted pages or clever internal links. But chances are, it’s largely happening organically. You just need to learn exactly how it’s happening. This does exactly what it sounds like. It shows you the steps someone took right before visiting. Each sequence of steps becomes its own path, which is then ranked by frequency of occurrence. You’ll notice your Thank You confirmation pages on the far left. You might see an intake or opt-in or purchase page next to it on the right. 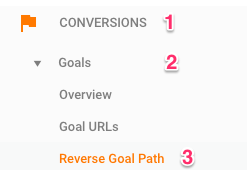 Then over to the far right, the landing pages and the pages or posts that sent people into this conversion sequence. Jackpot. Now, send more people to these pages. Doesn’t take a rocket scientist to figure that out. Go back to your blog posts that bring in traffic, add CTAs and internal links to these top-performing pages, and remove all the other junk that now only serves as a distraction. SEO shouldn’t be difficult. It isn’t difficult when you boil everything down to the SEO basics. Too often, we make it difficult. We over complicate or worry about things far, far outside of our control. Those things take us away from the simple solutions that are often staring us in the face. SEO has changed. But it hasn’t changed at all. Help people find what they’re looking for. Make it easier to find. Make it more beautiful, thorough, accurate, interesting, and entertaining. Then, tell people what they should do next to get more of the good stuff. Algorithms are designed to reward excellence. So do that. Screenshots by Brad Smith. Taken October 2017.